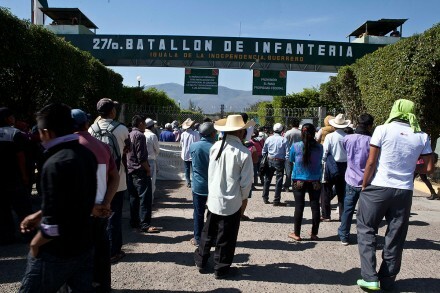 Relatives of the 43 students at the 27th Infantry Battalion in Iguala, Guerrero. Photo by: Germán Canseco. A key piece in the version that the PGR has published after the disappearance of 43 Ayotzinapa students is that the students were detained and taken to the base of the Iguala Municipal Police before being delivered to the United Warriors cartel. But the judge that would have received them assures that was not the case. In this sixth delivery of the reporting carried out with the support of the Investigative Journalism Program of the University of California at Berkeley, documents and testimonies strengthen the version of the judge, who currently is asking for asylum in the United States and fears for his life. MEXICO, D.F. (Proceso). – Ulises Bernabé García was a booking judge for the Iguala Municipal Police in Guerrero on the night of September 26, 2014, when the enforced disappearance of 43 students from the Ayotzinapa Rural Teachers College was perpetrated. In an exclusive interview he reveals what happened that night. In this sixth delivery of the investigation carried out with the support of the Investigative Journalism Program of the University of California at Berkeley, García asserts in an interview –from a Mexican border city and crossing point to the United States– that the students were never taken to that base [headquarters] and that the Cocula municipal police did not arrive either, as the official version asserts. His testimony and the documents obtained for this investigation reveal that the worst part of the attacks against the students occurred when the Attorney General of the State of Guerrero, the 27th Infantry Battalion and the Federal Police were operating in the streets of Iguala. One of the principal parts of the official version is that, at 11:30 that night, Iguala police took the students from Juan Alvarez Street –where one of the aggressions against the students occurred– to the municipal police base. In one version, the PGR asserts that there were 43 and, in another, only 10 or 15. From there, in two patrol vehicles of the Cocula Municipal Police they were taken to the Loma de los Coyotes spot, where they handed them over to the United Warriors criminal group, who allegedly murdered them and burned them in a garbage dump at midnight of that same day. In contrast, García asserts that, at the time that the Attorney General of the Republic (PGR) says that the students were taken to the municipal police base, a military man known as “Captain Crespo,” of the 27th Infantry Battalion of Iguala, in command of a group of 12 armed soldiers in uniform made an exact inspection in all of the (police) command for more than 15 minutes. A little later, García points out, the assistant attorney general of Guerrero, Víctor León Maldonado arrived at the same site and took control of the base for the rest of the night and until 8 o’clock in the morning of the next day. Note: Representatives of the Ayotzinapa parents and students made note of this new information in their meeting with adherents to the Sixth in Northern Chiapas. And, an official of the Guerrero human rights office confirmed the above account of Ulises García to La Jornada Guerrero.